Are we still available on the date of your show? Call our agent to find out! 612-240-6679. 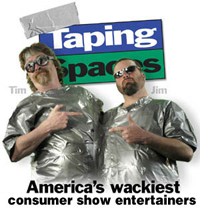 Since 1995, the Duct Tape Guys have been performing "breathtakingly stupid" comedy based on their best-selling (over 3 million sold) Duct Tape Book series. 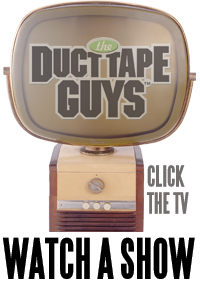 The Duct Tape Guys have appeared on nearly every television broadcast and cable network, on thousands of radio stations around the world and have entertained at consumer shows and corporate events around the world. WHAT THEY DO FOR YOU: Through their media appeal and marketing prowess, the Duct Tape Guys grab tons of additional publicity for your show. Then they provide unique, g-rated, all-age appeal, funny entertainment that is a tremendous crowd draw. Vendors appreciate this and show attendees have a great time. 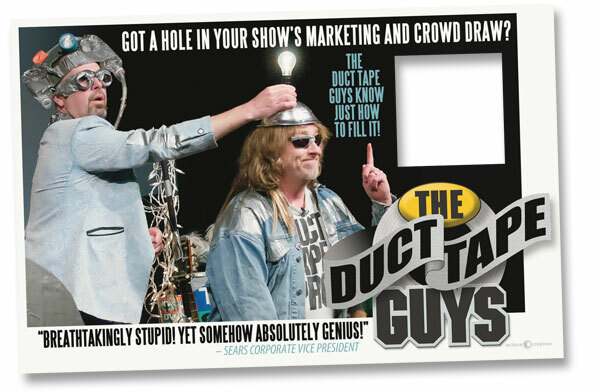 Visitors often share with show producers that the Duct Tape Guys were the main reason that they came to the show. The Central Washington Home Builders Association would highly recommend the Duct Tape Guys for your show. They were extremely professional and willing to help with all media. They also brought the traffic into the show like no other performer we have had that cost way more than their reasonable fee. The bang for the buck was definitely there for us.- Carly Faul, Executive Officer. "You guys are the biggest crowd draw of our shows!" - Rob Lynch, President of Orchard Supply Hardware in reference to The Duct Tape Guys' appearances at their "How To Fairs" (the other regular performers are celebrities from PBS, HGTV, and various television and radio shows). As you may have noticed in the referrals above, the Duct Tape Guys provide much more than entertainers who cost many times what they charge. The currently posted rates for the Duct Tape Guys are posted on our sample contract page. Remember that you're not only hiring entertainers for your show, you're getting a marketing powerhouse to help promote your show and boost attendance. JUNE 2014 update: We have just lowered our rates AGAIN to help accomocate recession-tightened budgets - to encourage YOU to try us out for the first time. Or, like so many of our clients, to help you bring us back again! First, check their calendar to see if the dates that you are looking for are available. Then, call Tim, the Duct Tape Guys' booking agent - contact info here. Tim will discuss your show's needs, make recommendations as to the most effective way to use the Duct Tape Guys, and he'll draw up a contract. The signed contract and a 50% downpayment of the entertainment day(s) will be required to reserve the date for your show. Media airchecks and video clips that will help you get your local TV shows interested in having the Duct Tape Guys as guests; Photos and Graphics for print advertising; Press Releases and Bios, Publicity Copy and more. Jim and Tim set up their duct tape cam and grabbed some video of their show at the Syracuse Home Show (March 2012). You can watch it right here by clicking the TV set. 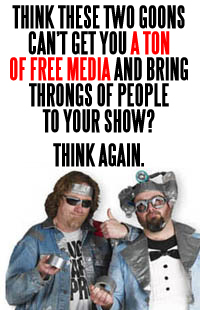 The Duct Tape Guys have proven again and again (over the past 17+ years of performing) that they can get a TON of free media exposure for their consumer show clients. 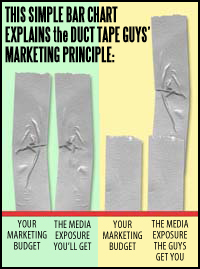 WITH the Duct Tape Guys figured in to your marketing budget, you can actually spend a LOT LESS on advertising because they'll grab you more radio, television and print media exposure for FREE! And, because it's marketing through humor and entertainment instead of blatant advertising, it actually forms a stronger advertising message in the viewers' minds. All it takes is a few phone calls telling the media that The Duct Tape Guys are coming and will be available for interviews, radio phoners, and in-studio appearances... Point them to the airchecks and video clips. The media loves the Duct Tape Guys! Why are they so popular? "The Duct Tape Guys are hysterical! We laughed so hard, phlegm came up!" "Man, you guys are just plain nuts! Thank you! That was incredibly fun." The Duct Tape Guys have been evangelizing the "Gospel of Duct Tape" since 1994. They're about to publish their eighth book (the title is still a secret). The Duct Tape Guys' stage show has been described as taking Abbot and Costello, Bob and Doug McKenzie, Bob Villa, Carrot Top and your weirdest uncles - binding the whole lot together with duct tape and dousing it with a liberal dose of bizarre creativity. It's fun for everyone! The Duct Tape Guys have deemed themselves as "breathtakingly stupid" yet somehow have impressed corporate big wigs as being "sheer genius!" Why? These two ordinary guys have turned a common, humble household product into an over three million-copy bestselling publishing venture and create media frenzy wherever they go. They've entertained on radio, television and in front of live audiences all over North America and Europe for nearly two decades and are just now hitting their stride. Jim and Tim's G-rated comedy will both entertain you, and leave you thinking, "Why didn't I think of that!" Either that or, "These guys are absolutely nuts!" "As featured on The Discovery Channel, History Channel, TBS, Fox, CBS, NBC, ABC, MSNBC, CNN..."
"Also featured in People Magazine, Newsweek, Entertainment Weekly, The Wall Street Journal..."